The Posterior Abdominal Wall is formed by the lumbar vertebrae, pelvic girdle, posterior abdominal muscles and their associated fascia. The stretch of the posterior abdominal wall is between the 12th rib above and pelvic brim below. the power of this wall is more. As well as it is stable (cf. the anterior abdominal wall is soft and distensible) because it’s assembled by bones, muscles, and fasciae. The retroperitoneal organs, vessels, and nerves are all supported by the posterior abdominal wall. Bony part: In the median plane, it’s created from bodies, intervertebral disc, and transverse processes of the 5 lumbar vertebrae. Laterally it’s dividedinto upper and lower parts by the iliac crest. The part above the iliac crest is made of inner surfaces of the 12th rib and the part below the iliac crest is made of iliac fossa. Muscular part: Above the iliac crest, from medial to lateral sides, it’s created from psoas major, quadratus lumborum, and transversus abdominis muscles. 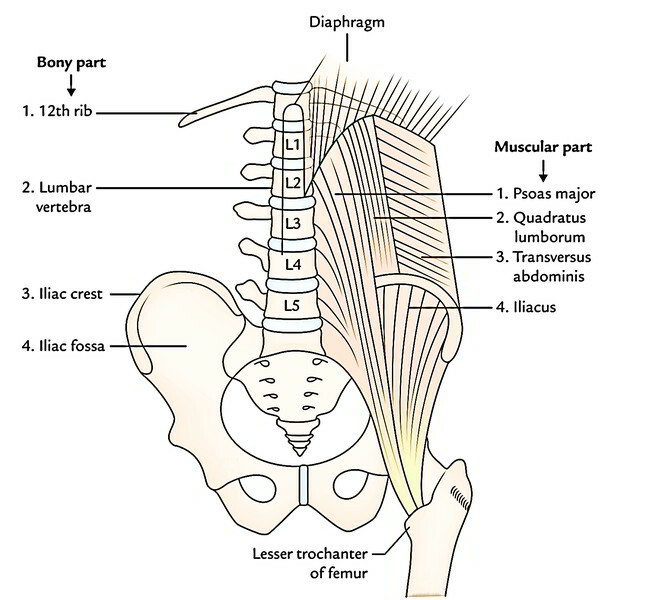 Below the iliac crest on each side of the lumbar vertebral column from medial to lateral sides, it’s created from psoas major and iliacus muscles. In addition to such muscles, the diaphragm finishes the abdominal wall superiorly. Fasciae: The psoas major and iliacus muscles are covered by fascia iliaca. The quadratus lumborum is enclosed between the anterior and posterior layers of the thoracolumbar fascia. Muscles and fasciae of the posterior abdominal wall. Great vessels of the abdomen (example, abdominal aorta and inferior vena cava [IVC]. Lymph nodes and lymphatics of the posterior abdominal wall. Nerves of the posterior abdominal wall. 3 muscles viz. psoas major, iliacus, and quadratuslumborum, on every side of the vertebral column create most of the posterior abdominal wall. The lymph vessels emptying the posterior abdominal wall and majority of the abdominopelvic organs with the exception of part of the liver terminate in the cisterna chyli and thoracic duct. The lymphatic flow is intercepted by a series of lymph node groups before reaching the cisterna chyli and the thoracic duct. It’s an elongated white lymphatic sac about 5-7 cm long and 4 millimeters wide. It is located on the front of L1 and L2 vertebrae between the aorta and the azygos vein, concealed by the right crus of the diaphragm. Superiorly it continues as the thoracic duct. Left and right intestinal lymph trunks– from the preaortic lymph nodes, which open in its middle. These trunks drain the lymph from the small intestine, stomach, and liver. Left and right lumbar lymph trunks– from the paraaortic lymph nodes, which open in it inferiorly. A pair of lymph vessels- from the lower intercostal lymph nodes, which open in it superiorly. All these can be found along the external iliac arteries, common iliac arteries, and abdominal aorta, and consequently called external iliac, common iliac, and aortic lymph nodes. These are 8-10 in number and is located along the external iliac vessels. The medial nodes get the lymph from the pelvic viscera and lower limb, while the lateral nodes get the lymph from the territories of inferior epigastric and deep circumflex iliac vessels. Afferents from these nodes enter the common iliac nodes. These are 4-6 in number and are located along the common iliac vessels (Lateral group) and below the bifurcation of the aorta (medial group). The Lateral group of nodes gets the lymph from the pelvis and lower limb via external and internal iliac nodes, while the medial group of nodes gets the lymph from the pelvic viscera directly and via the internal iliac and sacral nodes. They can be situated along the abdominal aorta and inferior vena cava, and are ordered into 2 groups- pre-aortic and para-aortic. Pre-aortic nodes: The nodes are situated around the origin of coeliac, superior mesenteric, and inferior mesenteric arteries and are consequently termed as coeliac, superior mesenteric, and inferior mesenteric nodes. They get the lymph from the organs supplied by these arteries. The efferents from pre-aortic nodes create the intestinal lymph trunks, which drain in the cisterna chyli. Para-aortic (lateral aortic) nodes: They may be situated on every side of the abdominal aorta, some nodes of the group are located supporting the aorta and termed retroaortic nodes. The para-aortic nodes are also termed lumbar nodes. They get the lymph from suprarenal glands, kidneys and ureters, and testes or ovaries. They also get the lymph from the majority of the pelvic organs and the lower extremities via internal iliac, external iliac, common iliac, and other pelvic nodes. The efferents from para-aortic nodes create lumbar trunks which drain in the cisterna chyli. The nerves of the posterior abdominal wall contain subcostal nerve, ventral rami of lumbar nerves, and lumbar sympathetic chains.